The cavity is located in Via Vittorio Veneto on the opposite side of number 40. It was realized to extract building material and has an irregular shape with a perimeter of about 150 meters and an internal development of approximately 600 square meters. During the excavation of the rock were spared inside the cavity, five squat pillars square base in order to make them stronger and at the same time avoid collapse. 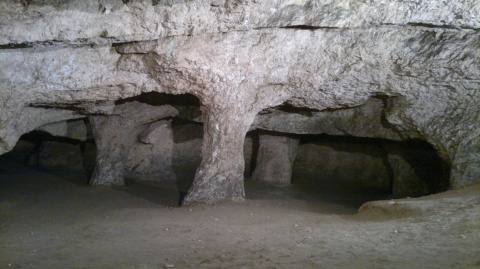 Once the excavation stopped probably, the cavity was used as a water tank. That use, in the opinion of Canon Giovanni Spano, would begin in the Carthaginian era and continued into the Roman period. In 1943, during World War II, the cavity was reused as a bomb shelter and was also made ​​a rudimentary electrical system inside. After the war, the cavity gave for some time precarious shelter to those displaced persons who, on their return to Cagliari, founded their homes destroyed by the bombing. On the last decades Via Vittorio Veneto was renovated and several dilapidated houses against the outer wall of the cavity were teared down.